While Dallas's park system has several beautiful and highly functioning parks, the City will need to expand the park system during the next 20 years to accommodate a growing population and meet the needs community members currently underserved by the park system. Continuing expansion of the park system will help to reduce crowding in parks and avoid stress on parks facilities, equipment and natural resources. As discussed on the Park System Inventory page, Dallas's parks currently have a Level of Service (LOS) ratio of 6.12 acres of parkland per 1,000 residents. This is slightly lower than the ratio range of 6.25 - 12.5 recommended by the Oregon Statewide Comprehensive Outdoor Recreation Plan (SCORP). The population of Dallas has been projected to reach approximately 16,651 by the year 2020 (or a 12.5% increase). 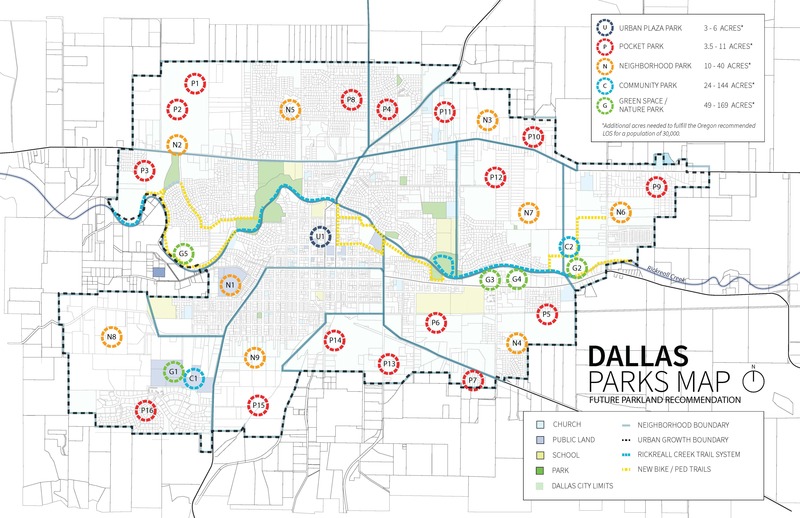 To reach the recommended LOS of 6.25 for a population of 16,651, the City of Dallas should aim to add 13 acres of parks and open space to the existing park system by the year 2020. The City should plan to provide park facilities in underserved areas and where future residential development is expected. The areas currently underserved are the neighborhoods north of West Ellendale Avenue, south of downtown, and along the eastern edge of the City. This is not intended to prevent the City from acquiring lands in other areas if opportunities emerge; rather to focus on specific areas of need. Future parkland expansion should also focus on the development of walkable neighborhood parks. Pocket parks can provide supplemental parkland where neighborhood parks are outside of a 1/2-mile radius or homes or places of business. Goal 1 - "Future Parkland Identification". The map above displays potential land acquisition target areas that were identified in the parkland needs analysis. The overlays on the map indicate neighborhood groupings the planning team determined based on physical barriers (waterways, roadways) and size of areas. These neighborhood groups were used to analyze park needs with a finer grain when looking at the City as a whole. The icons represent different park types, or classifications (as described on the Park System Inventory page). Icons are placed in approximate areas for each neighborhood grouping. These icons do not indicate exact parcels for development (except when parks are proposed on existing publicly owned land). PE-1: Adopt a Level of Service standard of 6.25 acres/1,000 population with the objective of providing neighborhood parks within a 1/2 radius of all residents. PE-2: Incorporate the goals, action items, and recommendations from this Parks Master Plan in the Dallas Comprehensive Plan. PE-3: Amend the City of Dallas zoning code to include requirements for parkland development in new subdivisions. PE-4: Use planning tools such as overlay zones to designate future parkland development and required parkland classifications for new neighborhoods. PE-5: Use a Parkland Identification Tool to evaluate whether potential sites for park system expansion meet the needs of Dallas residents. Click the link below to see Dallas's park Design Guidelines & Recommendations.